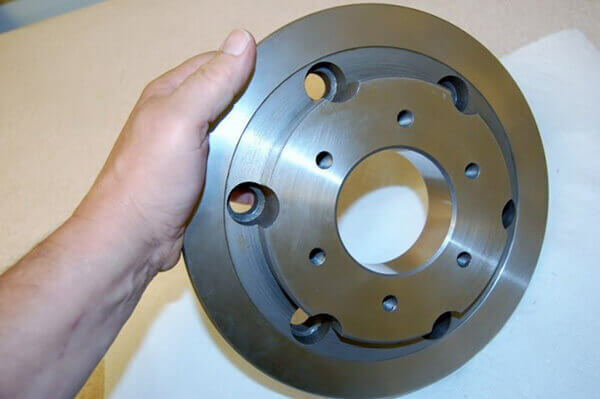 Your Doosan spindle is in expert hands with the factory-trained, Big Plus–certified technicians at High Speed Technologies, Inc. We have repaired dozens of Doosan spindles to original factory performance. Need it fast? We can repair your spindle within three days of customer approval, and we offer reduced pricing for longer lead times. All spindle repairs are backed by a complete warranty and our 30-year reputation of OEM-quality spindle repair. Doosan is a relatively new entrant in the machine tool industry. They started in the mid-1970s and had sold 1000 units by 1979. In the early 1980s Doosan introduced their Puma line of machine tools and shortly after that they began exporting machines worldwide. 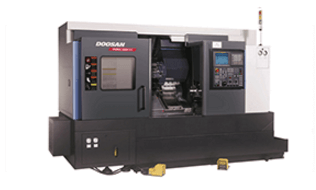 In 1994 Doosan started the American Corporation, Daewoo Machinery Corp. Today Doosan offers a broad range of high quality CNC machines including, vertical and horizontal mills and lathes. They have placed tens of thousands machines throughout the world. Below are other examples of HST’s OEM-quality repairs on Doosan spindles. For expert Doosan spindle repair, call us at 1-603-483-0333 for a quote. We are fast, experienced, and our work is guaranteed. HST Job I-0732: A customer sent us this Puma 2600Y lathe spindle for repair. As a testimony to what level of precision shops expect from the machines today, the customer complained that the machine was making parts with 0.0005” run-out (12.7 µm). At HST we are used to working in the single micron range. But the difficulty for us with this good sized lathe was getting surfaces to verify the part run-out. Worn bearings are the most likely culprit for causing poor part quality. However, upon inspection the bearings looked to be in rather good shape. We did not find any indications of loss of capture or unloading. The next most likely source is the tool interface. When searching for a few microns of run-out even a small ding can lead to part rejection. And small dings are what we found. It seems that someone dinged the taper when they were changing out the chuck adapter plate. When metal is impacted enough to cause a dent, the surface area around the dent is raised. Even a small dent can be enough to cause poor part quality. Several small dings on the taper surface are easily evident after a light kiss grind on the taper interface. There was still the problem of how to test the performance after we finished rebuilding this large Doosan Puma lathe. There are some very fine adapter plates available. But not fine enough. To accomplish this we precision ground two parallel surfaces, one radial surface, and one tapered surface on a high quality, standard chuck adapter plate. This allowed us to get accurate readings. Final assembled run-out readings were 2µm. That was about the accuracy of the adapter plate that we modified. After installing ABEC 7 Super Precision Bearings and testing the run-out, the spindle gets broken-in. This can take more than a whole day and in fact we often run grease spindles for more than 12 hours before we even start taking vibration readings. Here is a fully instrumented Doosan Puma 2600 Y lathe spindle being belt driven on one of our run-up stations. 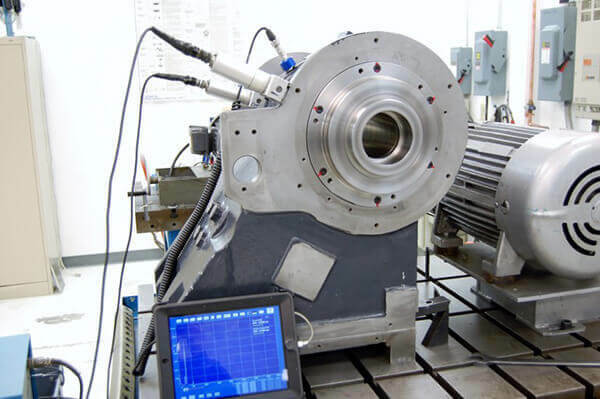 Job I-7634: When a large gun manufacturer had a critical Doosan vertical mill go down with a spindle failure they turned to HST for a fast emergency repair. As soon as we opened up the spindle we saw the problem. Water had penetrated the whole spindle. Many parts were badly rusted and of course the bearings were completely trashed. The job got our QTA treatment and the Doosan VC 510 was back up and running in a couple of days with good numbers. Front acceleration was 0.4057 g and the velocity was 0.0170 in/s. But where did the water come from? HST didn’t leave the customer in the lurch. We visited the plant where they discovered the water separator for the air system used for keeping debris out of nose was completely filled with water. It had failed and allowed water to be blown into the whole spindle. At HST we repair all makes and models of Doosan spindles. We only use top name brand ABEC 7 super precision spindle bearing in your repair. 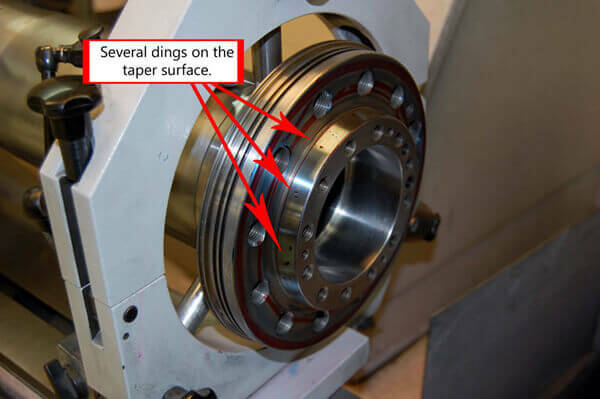 For further questions about Doosan Spindle Repair give us a call 1-603-483-0333 during business hours or contact us for an estimate.